Last week, Chicago officials held a ribbon-cutting ceremony on “the greenest street in America,” a two-mile stretch of Cermak Road and Blue Island Avenue in the city’s Pilsen neighborhood. In addition to new pedestrian and bicycle features, the innovative new street surface will filter stormwater, helping to prevent the city’s combined sewers from overflowing. Most impressive of all, the cement used to pave the street cleans the surface of the roadway and removes pollution from the air. Cermak Road isn’t the prettiest in Chicago; the busy truck route passes through a gritty industrial corridor that includes the now-shuttered Fisk coal plant. But Chicago Department of Transportation officials were able to see green in the South Side thoroughfare. Thanks to a mix of local Tax Increment Financing and Federal Highway Administration grants, the street now boasts the most sustainable elements in a single stretch of road in the country. The new roadway uses photocatalytic cement, an innovative new paving surface that contains nano particles of titanium dioxide, enabling it to literally “eat” smog and remove nitrogen oxide gases from the surrounding air. Additionally, the sidewalks are paved with 30 percent recycled content, and more than 60 percent of all construction waste was recycled. Combined sewer overflows are a major issue in Chicago, a city that has some 4,000 miles of streets and more than 2,000 miles of alleys. When heavy rains occur, the stormwater ends up in the Chicago River and Lake Michigan, sending harmful chemicals down the Mississippi River towards the Gulf of Mexico. 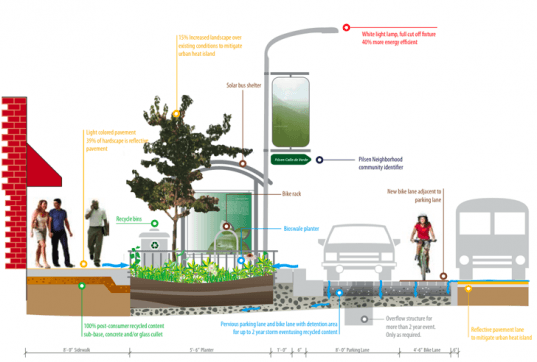 The use of permeable pavement helps to reduce the amount of rainwater that enters the sewer system. 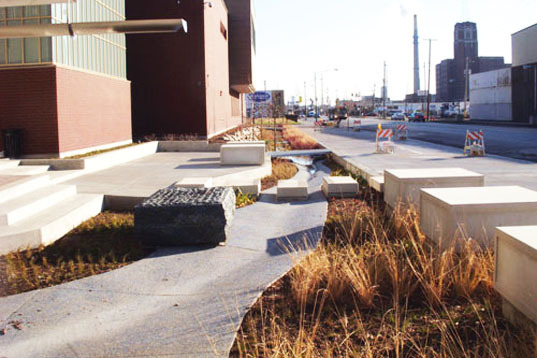 Through a combination of permeable pavement, bioswales and rain gardens, the new streetscape in Chicago’s Pilsen neighborhood is estimated to divert up to 80 percent of average yearly rainfall from the sewers. Here’s hoping this kind of streetscaping becomes more than just a pilot program, and that it extends to other parts of Chicago and beyond. Chicago streets have always been permeable; they're mostly holes. Last week, Chicago officials held a ribbon-cutting ceremony on "the greenest street in America," a two-mile stretch of Cermak Road and Blue Island Avenue in the city's Pilsen neighborhood. In addition to new pedestrian and bicycle features, the innovative new street surface will filter stormwater, helping to prevent the city's combined sewers from overflowing. Most impressive of all, the cement used to pave the street cleans the surface of the roadway and removes pollution from the air.